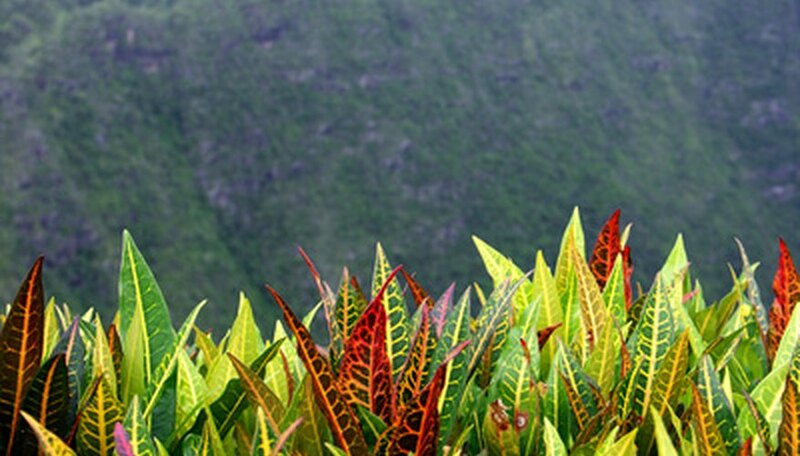 Crotons (Codiaeum variegatum) are vigorous, evergreen shrubs with colorful foliage. Croton's leathery leaves vary widely in size, shape and color depending on the cultivar. Crotons are not frost tolerant. If growing them in Texas, do so only in the state's southernmost regions. Crotons are freely branching, evergreen, irregular shrubs, growing up to 12 feet tall, but commonly seen shorter. Crotons have simple, leathery, spirally arranged leaves that often cluster at the ends of branches. Some types have smooth leaf margins and some are lobed. Croton color is highly variable by cultivar, including greens, reds and yellows. Crotons produce many small, but inconspicuous, flowers. Crotons prefer full sun for best color. Grow crotons on various, well-drained soils. They are moderately salt-tolerant. Croton leaves do not reach their most vibrant coloration if planted in partial sun. They are very tolerant of heat, but will not withstand hard frosts and are cold hardy only to USDA zones 9b through 11. In other areas of Texas, crotons must be container-grown, or protected from frost during winter. Crotons are common houseplants, but reach their full potential when planted outdoors in full sunshine. A moderate Texas climate, such as San Antonio, is perfect for landscaping with colorful crotons, according to Texas A & M extension literature. Plant crotons as accent plants, specimens, in foundation plantings, and in containers. Plant crotons close together and allow to grow to their full height to create a hedge. Hundreds of croton cultivars have been developed, including Gold Dust, a croton with bright green foliage and gold flecking. Magesticum has long, narrow leaves (18 inches or more) and a drooping form that changes from yellow to crimson with age. Roseo-Pictus has medium-length leaves and is spotted in cream, rose and yellow. Tortillis has twisted leaf blades. Croton sap is poisonous and staining. Pests of crotons include mites, scale, mealybugs and root rot if not planted in well-drained soil. Use 3 tbsp. of dishwashing liquid in 1 gallon of water to spray on foliage as a home remedy for spider mites and other garden pests. Your local county extension office is a good source of information regarding disease and insect identification and management. Marie Roberts is a writer based in Florida. She has a B.S. in horticultural sciences. Roberts began writing in 2002. What is the Homalomena Houseplant? What Plants Are Best for Container Gardens in Florida?